In your WordPress dashboard, navigate to "Users -> Settings -> Profiles" to access the profiles settings panel. The following settings screen allows you configure users profiles on your website. Allow guests to view profiles: Enable this option to allow guests to view users profiles. Allow members to view profiles: Enable this option to allow members to view users profiles. If disabled, users can only see their own profile. WPUM allows your users to upload custom avatars for their profiles. Uploaded avatars are stored on your server. Enable the option "Custom Avatars" to enable avatars upload for your users. 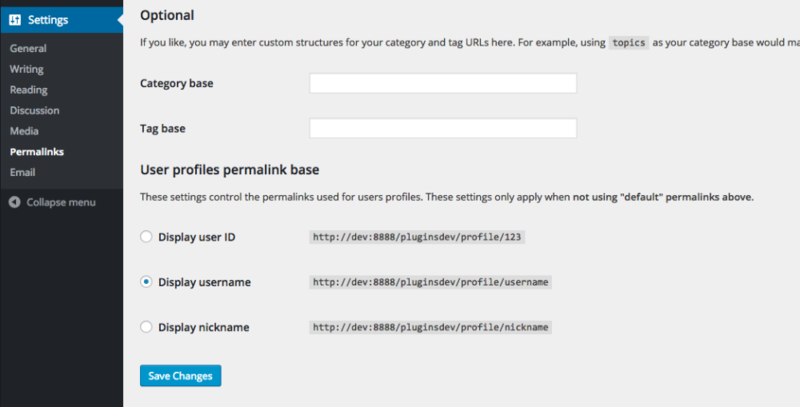 To adjust the url structure of your users profiles, navigate to "Settings -> Permalinks -> User profiles permalink base" and select a structure among the 3 available. Once selected, remember to save your changes.